Businesses from every sector across Birmingham have united in support of this summer’s big free art event – The Big Sleuth. From travel and hospitality to education and professional services, the best of Birmingham has pledged its support for the highly-anticipated sequel to The Big Hoot, which attracted more than 800,000 visitors in 2015 and raised over £625,000 in total for Birmingham Children’s Hospital Charity. Whilst researching for an upcoming presentation on Coroners Records at Who Do You Think You Are? Live at the NEC in April I found myself being sidetracked (a common occurrence!) by Dr John Birt Davies – the first Birmingham Coroner. This is one of those ‘Archives tales’ which shows the way something selected at random can lay trails for the curious; opening doors on, and raising questions about all sorts of subjects. I started with a volume titled ‘Charles Reece Pemberton. Lecturer on Poetry, Eloquence etc. 1790-1840’. I knew nothing about him. The word ‘poetry’ and his dates had drawn me in. By 1791, Birmingham was being hailed as the first manufacturing town in the world, and after it gained city status in 1889, it was named the City of A Thousand Trades because of the huge variety of companies based here. It’s also been called the Workshop of The World and the First City of the Empire. It was at The Soho Manufactory, the first factory in the world – that assembly-line mass production was created by pioneering industrialist Matthew Boulton. It was built on Handsworth Heath in 1766 and it made a range of goods including buttons and buckles and was home to the first steam-powered mint. The Soho Mint opened in 1788 and used eight steam-driven machines designed by Boulton to strike up to 84 coins a minute. Four FTSE100 companies have their HQ in the Birmingham area – the largest concentration of such firms outside London and the South-East. Birmingham’s wider metropolitan economy is the second largest in the UK with a GDP (gross domestic product – the value of all goods and services) of £68 billion. According to the rankings of the Globalization & World Cities Research Network, Birmingham is a beta level city – the third highest ranking in the country after London and Manchester. Birmingham has the highest level of entrepreneurial activity outside London, with more than 16,000 business start-ups registered in 2013. The city is behind only London and Edinburgh for private sector job creation between 2010 and 2013. Birmingham has 35 miles of canal compared with 26 miles of canal in Venice. And the entire Birmingham Canal Navigations (BCN) is a network of waterways connecting Birmingham and the Black Country. The BCN comprises 114 miles of waterways less than the 174 miles it had at its peak in the 18th century. More cubic metres of water flow through Birmingham’s canals than any other city in the world. Birmingham has “nearly 600 parks and public open spaces” compared with 400 in Paris. Birmingham City Council gave a more exact number with a figure of 571 parks and open spaces with more than 3,500 hectares of public accessible space, and 250 miles of urban brooks and streams. Birmingham City Council estimates that there are six million trees in the city. The 2,400-acre Sutton Park in Sutton Coldfield is the largest Urban Park in Europe. Birmingham’s annual German market – officially the Frankfurt Christmas Market – is the largest outdoor Christmas market in the country and the biggest outside Germany and Austria. It attracts more than five million visitors, earning £90 million for the city, and is even bigger than the market staged in German capital Berlin. Outside London, Birmingham has the UK’s largest Muslim, Sikh and Buddhist communities, the second largest Hindu community and the seventh largest Jewish community. The city’s Sikh Vaisakhi celebrations are the largest in Europe. Birmingham is one of the UK’s top conference destinations. According to Core Cities, the National Exhibition Centre Group (which has four venues in Birmingham: the NEC, International Convention Centre, LG Arena and NIA) attracts more than 4 million visitors a year. That’s 42 per cent of the UK’s total exhibition trade and major conferences. Birmingham’s St Patrick’s Day Parade is the third biggest in the world, after New York and Dublin with more than 80,000 people turning out to celebrate the occasion. Birmingham has a large Irish community dating back to the Industrial Revolution when Irish people, known as ‘Navvies’ moved here to work in the construction of canals, railways and factories and is estimated to have the largest Irish population in the UK. The city has the UK’s only Irish Quarter, centred on Digbeth and Deritend. As well as its famous waterways, Birmingham is home to the Gravelly Hill interchange, better known as Spaghetti Junction the best known motorway junction in the UK. The M6 passes through Birmingham on the longest bridge in the UK the Bromford Viaduct Birmingham was also the terminus for both of the world’s first two long-distance railway lines – 1837’s 82-mile Grand Junction Railway & the 112-mile London and Birmingham railway of 1838 whose terminus at Curzon Street was the first railway station. New Street station is the busiest train station in the UK outside London In addition, the Number 11 Outer Circle bus route is the longest urban bus route in Europe, reaching a length of 28 miles. Birmingham has five Michelin-starred restaurants, more than any other city in the UK outside London. Glynn Purnell, Adam Stokes, Luke Tipping, Richard Turner and David Carter are the Chef Patrons. Birmingham is the birthplace in 1977 of the Balti – a type of curry served in a metal bowl (karahi) & home to the Balti Triangle, an area encompassing Sparkbrook, Balsall Heath and Moseley, where there are more than 100 Asian restaurants. Well-known food brands that originated in the city include Bird’s Custard, Typhoo tea, Cadbury’s chocolate and HP Sauce. Alfred Bird created Bird’s Instant Custard in 1837 as his wife was allergic to eggs used to thicken earlier versions of the dessert. In 1863, William Sumner published A Popular Treatise on Tea and in 1870 started a grocery/pharmacy business with his son John in High Street, Birmingham. It was in 1903 that John’s son, John Sumner Jr, created Typhoo Tea – taking the name from the Chinese word for doctor after his sister said she had found relief for her indigestion by drinking a brew made from the tiniest particles of tea leaf, rather than the usual large leaf variety. Sumner Jr sold the tea pre-packaged rather than loose. Typhoo became one of the largest makers of teabags in the UK. Birmingham is the youngest city in Europe with 25 year olds and under accounting for nearly 40 per cent of its population. Birmingham has five universities: Aston, Birmingham, Birmingham City University, Newman University College & University College Birmingham. Birmingham University was founded in 1900 by Joseph Chamberlain and was the first ‘Redbrick’ University. The region as a whole produces over 111,000 graduates each year making it the second largest student area in the UK. In 2011 Birmingham had more than 78,000 students living in the city during term-time more than any other city in the UK outside London. The national educational charity University of the First Age was founded in Birmingham by Professor Tim Brighouse in 1996.Birmingham Business School founded in 1902 is the oldest graduate-level business school in the UK. Birmingham Museum and Art Gallery holds the largest collection of Pre-Raphaelite art in the world as well as Europe’s finest collections of ceramics and fine metalwork. Also on display there is the Staffordshire Hoard, the largest collection of Anglo-Saxon gold and silver metalwork ever found. It consists of more than 3,500 items with over 5kg of gold, 1.4kg of silver and 3,500 cloisonné garnets. BMAG also contains the largest complete bronze sculpture of its kind in the world in the Sultangani Buddha found in the North Indian town of Sultangani during the construction of the East Indian Railway & dates from 700-800 AD. The Barber Institute of Fine Arts has been described as one of the finest small art galleries in the world. Birmingham Science Museum Thinktank, has the world’s oldest working steam engine and the UK’s first purpose-built digital planetarium. England’s first municipal bank was set up in Birmingham by the then Chancellor of the Exchequer and later Prime Minister Neville Chamberlain, eldest son of the ‘Father of Birmingham’ Joseph Chamberlain. The Birmingham Corporation Savings Bank later Birmingham Municipal Bank was set up to raise money for the First World War effort. It opened on September 29, 1916. The Midland Bank and Lloyds Bank were also founded in Birmingham. The world’s first building society – Ketley’s Building Society – was founded in Birmingham in 1775 by Richard Ketley who was the landlord of The Golden Cross pub. In Birmingham on January 11, 1896, John Hall-Edwards was the first man to use X-rays under clinical conditions by taking an X-ray image – or radiograph – of a needle embedded in someone’s hand. On February 14, 1896, he was the first to use X-rays in a surgical operation. He also took the first X-ray of the human spine. Birmingham surgeon Dr Joseph Sampson Gamgee invented the surgical dressing called Gamgee Tissue – cotton wool between two layers of gauze – in 1880. His name became an inspiration for The Hobbit character Sam Gamgee in Tolkien’s The Lord of the Rings. Birmingham businessman and Aston Villa FC Chairman Sir William McGregor founded the Football League, the world’s first football league competition. In 1888 that he suggested that 10 or 12 of England’s top clubs get together to arrange fixtures and the English Football League was formed.in Birmingham and the city is where the first FA Cup was made. The very first trophy had been produced in Sheffield but was stolen from a display window in Birmingham in 1895 after Aston Villa had won the cup. The second trophy – and the oldest one surviving today – was a replica of the first and made by Vaughton’s of Birmingham, which still exists in Well Street,.Birmingham was first British city to be named National City of Sport by the Sports Council and held the IAAF World Indoor Athletics Championships at the National Indoor Arena in 2003. Of the 4,000 inventions copyrighted in the UK a year, 2,800 come from the Birmingham area. Peter Colegate of the Patent Office said: “Every year, Birmingham amazes us by coming up with thousands of inventions. It is impossible to explain but people in the area seem to have a remarkable ability to come up with, and have the dedication to produce, ideas.” Among the inventions to come from Birmingham were James Watt’s paper copier, the smoke detector, household vacuum cleaner, cooker, mass spectrometer and microwave oven. In 1929, Brylcream was created by County Chemicals at the Chemico Works in Bradford Street, Birmingham. Joseph Priestley who was a prominent member of Birmingham’s Lunar Society and a Unitarian preacher whose inflammatory sermons advocating Revolution earned him the name: ‘Gunpowder Joe’ was the first man to isolate Oxygen in 1787. The world’s first pneumatic tyre was made by John Boyd Dunlop in 1888. He sold the rights to Harvey du Cross Jr who founded the Dunlop Rubber Company in 1889. The former tyre manufacturing plant Fort Dunlop was built in 1916 and was at one time the largest factory in the world, employing more than 3,200 people. In 1922, Dunlop invented a tyre that lasted three times longer than any other, and Dunlop tyres have helped many drivers and their cars to victory at the Grand Prix, Le Mans, Formula 1 and British and world land speed records. In 1940, just after the start of the Second World War, Castle Bromwich Aircraft Factory started production of the Spitfire fighter plane and became the largest Spitfire factory in the UK, producing up to 320 aircraft per month. When production ended at Castle Bromwich in June 1945, a total of 12,129 Spitfires had been built – more than half of the 20,000 ever produced. Sir Francis Galton, born in Birmingham in 1822, is credited as the first to apply statistical methods to science. In doing so, he gave birth to the science of meteorology by creating the first weather map, compiled using data from all of Britain’s weather stations in October 1861. A half-cousin to Charles Darwin, whose grandfather Erasmus Darwin from Lichfield near Birmingham had been a prominent member of Birmingham’s Lunar Society, Galton also coined the term Eugenics (improving human genetics through controlled breeding), devised a method for classifying fingerprints and introduced the use of questionnaires and surveys for collecting data on human communities. The Mini, an icon of the swinging Sixties, was manufactured at Birmingham’s Longbridge plant from 1959 to 2000. In 1999 the Mini was voted the most influential car of the 20th century, and in 2014 it was named Britain’s favourite car of all time in a survey by motoring magazine Autocar. By the late 1960s, Longbridge was the biggest car plant in the world and employed around 30,000 workers. And it all started here in Brum. It was in 1895 in Birmingham that Frederick William Lanchester built the first petrol-driven four-wheeled car in Britain. He also invented the accelerator pedal and the carburettor. Having tried the new engine in a boat and created Britain’s first motorboat, he decided to design a four-wheeled vehicle that would run on petrol. He worked on the car at workshops in Ladywood Road, Fiveways, and then he and his brothers set up a factory in Montgomery Street, Sparkbrook, which still exists to make the cars so they could be sold to the public. Birmingham’s Gun Quarter was for many years the centre of the world’s gun manufacturing industry. In 1865 nearly 10,000 people were employed in the city’s gun industry. BSA – the Birmingham Small Arms Company – began as a gun-maker founded in Birmingham’s Gun Quarter in 1861 before venturing into bicycles, motorbikes and cars. BSA was at one time the largest motorcycle producer in the world and Birmingham bikes won many awards for speed and quality. The BSA Bantam was a popular small motorcycle made in Birmingham which is still produced under licence in India today. Famous novelist Charles Dickens gave the first public performance of A Christmas Carol in Birmingham Town Hall in December 1853, 10 years after its publication. He performed it over three hours 15 minutes in front of a crowd of 2,000 local people – taking only a 10-minute break for a quick swig of beef tea. Birmingham’s Sherlock Street – where Doyle is said to have bought a violin – and the surname of Birmingham printer John Baskerville were obvious influences on his later literary works, with the first Sherlock Holmes story (A Study in Scarlet) published in 1886 and The Hound of the Baskervilles appearing in 1901. Doyle’s time here is commemorated by a blue plaque on the building on the site of his former home at 63 Aston Road North. The Reverend Wilbert Vere Awdry, creator of The Railway Series about Thomas the Tank Engine, was a curate at King’s Norton, Birmingham, from 1940 to 1946. While living there in 1943, he invented stories featuring trains – based on his experiences hearing the engines puffing along the railway line at Kings Norton – to entertain his son during a bout of measles. The American-born author of ‘The Legend of Sleepy Hollow’ which was made into a film starring Johnny Depp and ‘Rip Van Winkle’ lived and wrote for a time in Birmingham during the early18th century. Birmingham’s ‘Film Triumvirate’ is made up of Sir Michael Balcon, Brummie Grammar Schoolboy and Britain’s first ‘Film Mogul’ who at one point worked for Louis B. Mayer at MGM, Victor Savile, who bankrolled Balcon and Oscar Deutsche who founded the ODEON Cinema Chain in Birmingham in the 1930’s were Brum’s three film ‘movers and shakers’ All three could at one time be found on a ride on the Inner Circle number 8 ‘Corporation Buzz’ in Birmingham’s inner city! Birmingham Grammar School Boy Sir Michael Balcon founded The Ealing Studios which gave us those great ‘Ealing Comedies’: ‘Kind Hearts and Coronets’, ‘The Lavender Hill Mob’, ‘Passport to Pimlico’, ‘The Ladykillers’ and ‘Whiskey Galore’ should be more celebrated in Birmingham as possibly Britain’s greatest film maker, the man who discovered Alfred Hitchcock, whom many think is Britain’s best film maker…..? After leaving school in 1912 Balcon joined up in 1914 at the outbreak of The Great War and tried to establish some of the early ‘Birmingham Pals’ Regiments in The Great War but ironically could not fight and serve himself due to defective eyesight………. Balcon also named his ‘Everyman Copper Hero’ and most enduring character PC George Dixon of ‘Dixon of Dock Green’ after his old school which was named after Education Reformer and the founder of Edgbaston High School for Girls: George Dixon MP, a direct contemporary of Joseph Chamberlain MP the founder of municipal Birmingham. PC George Dixon first appeared in the 1949 Ealing Studios film: ‘The Blue Lamp’ where he was shot in a bungled cinema robbery by a young Rank Starlet on loan to the Ealing Studios Dirk Bogarde….remember him? PC Dixon’s cheery Saturday evening greeting: ‘Evening All’ has gone down in TV folklore. ‘Dixon of Dock Green’ ran from 1952 until 1976 when Jack Warner, the actor who played PC Dixon for all those years became too old for the role. There are also links to Hollywood as his Grandson is possibly the greatest ever screen actor the three-time Oscar winner for ‘Best Actor’ Daniel Day-Lewis. 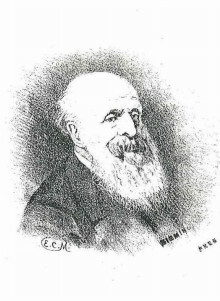 George Dixon was a former Lord Mayor of Birmingham of the 1870’s and a renowned educational pioneer in the city. He founded Edgbaston High School for Girls in Westbourne Road to educate young women, the daughters of artisans and craftsmen in Birmingham. George Dixon to those ‘Baby Boomers’ who grew up in 1960’s Britain meant a kindly, avuncular copper who pounded the beat in Dock Green in East London on black and white TV on BBC1 on Saturday evenings. Did you know how PC George Dixon got his name…? Ealing Studios released a film called: ‘The Blue Lamp’ in the early 1950’s starring Jack Warner as PC George Dixon. PC Dixon was shot dead by a very young actor named Dirk Bogarde (remember him…?) who played a petty villain on PC Dixon’s beat in bomb-damaged London. PC George Dixon’s name was inspired by Sir Michael Balcon’s former school George Dixon Grammar in Birmingham. PC Dixon was reincarnated for the very successful ‘Police Procedural’ TV show of the 60’s and 70’s on BBC1, still played by the original actor from ‘The Blue Lamp’: Jack Warner. Sir Michael Balcon’s daughter Jill Balcon established links with her father’s old school in Birmingham some years ago. Jill was part of an acting dynasty and married into the Day-Lewis theatrical family which includes Jill Balcon’s double-Oscar winner son Daniel Day-Lewis whose grandfather is Birmingham-born Sir Michael Balcon. Birmingham therefore is linked via Sir Michael Balcon and his Ealing Studios films to Hollywood and the Oscars won by his grandson Daniel Day-Lewis. Birmingham also has several other links to the early British film industry. The first ODEON ‘picture house’ was built in Birmingham by Oscar Deutsch. Birmingham also has the oldest continuously operating cinema in Britain in ‘The Electric Cinema’ in Station Street near the ‘Old Rep’ having first shown news reels and short films since 1909. Current owner Tom Laws has reinvented and reinvigorated ‘The Electric Cinema’ as a Art Deco cinema with a bar, double armchair-style seats which movie-goers can enjoy, creating an enjoyable personal cinema experience, totally different to the multiplex.